The Penguins came out in Game 3 and returned to the elite possession play that has been their hallmark down the stretch, but the play of Henrik Lundqvist threatened to all the Rangers to steal the win. There was no such hope tonight. Matt Murray became the first Penguins rookie to post a shutout after turning aside all 31 shots he faced, and the Pittsburgh offense made sure he had room for error as Evgeni Malkin scored 2 goals and added 2 assists, Sidney Crosby had 2 assists, and Eric Fehr, Patric Hornqvist, and Conor Sheary also added goals for the Penguins. Pittsburgh will return home for Game 5 looking to close the door on New York, and if the past two games are any indication they should be heavy favorites to do so. The Penguins came out flying to start the game, and after a strong start to the game by the first line it was the second line getting them on the board. Ben Lovejoy took a slap shot from the right boards, and Henrik Lundqvist gave up a juicy rebound in front of the net that Eric Fehr was able to put home to make it 1-0 Pittsburgh. It was a quick start that continued the momentum in driving the play that the Pens had established in Game 3, and it helped set them up for a big 1st period. Rick Nash would take an interference penalty when he knocked Trevor Daley to the ice in front of the crease, and it wouldn't take long before the Pens were celebrating their second goal of the game. Evgeni Malkin wristed a shot towards the net from the center of the zone, and Sidney Crosby managed to get a stick on it from between the circles, and it clipped off Patric Hornqvist's skate past Lundqvist. Hornqvist would get called for an interference minor on Marc Staal midway through the period behind the Rangers net, but New York was unable to make them pay for the offensive zone penalty. Shortly after getting back to even strength, Daley was getting into it with the other Staal brother. Eric Staal gave Matt Murray a cross check after the play, Daley shoved Staal, and the refs sent them both off - Staal for unsportsmanlike conduct and Daley for roughing. Daley wouldn't be able to get back to the bench before he was sent back to the penalty box for hooking Viktor Stalberg, but again the Penguins were able to thwart the New York power play. Pittsburgh would put the exclamation mark on the 1st period when Conor Sheary grabbed a Kevin Klein turnover on the Penguins' blue line and took off on a break away, wristing a shot past Lundqvist on the short side to make it 3-0. Malkin almost made it 4-0 seconds later when he put the puck in the net on a wrap around, but the refs waved off the goal after determining that Chris Kunitz had interfered with Lundqvist making the save. Dominic Moore holding Evgeni Malkin minutes into the 2nd, and Malkin would blast the puck past Lundqvist to make it 4-0, and Lundqvist wouldn't last much longer before Alain Vigneault would pull his netminder to save him for Game 5. The game was essentially over at this point, and all that was left was for the teams to play out the rest of it. There was a scary moment at the beginning of the 3rd period when Malkin took slash to the left hand by JT Miller and went to the bench in pain. It wasn't a good look for a player coming back from an injury to that part of his body, but he put concerns to rest when he came back out to score the power play goal on a redirection off a feed by Brian Dumoulin. 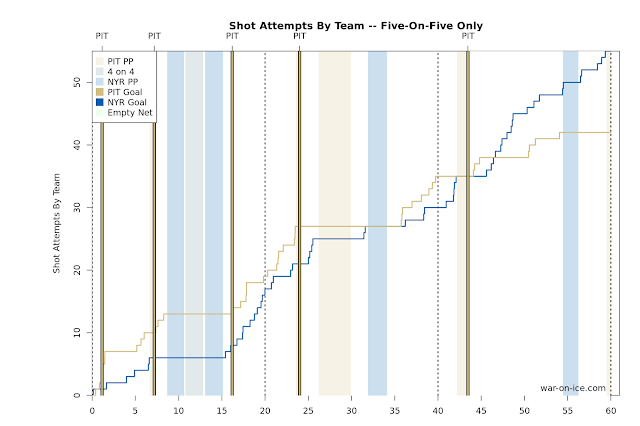 Pittsburgh just barely squeaked ahead of New York with a score-adjusted 50.1 CF%, but it didn't tell the story of the night as Pittsburgh raced out to a 3-0 lead and 57.1 SACF% in the first period, got an early goal in the 2nd period to extend the lead to four, and put things in cruise control the rest of the way. The Pens are back to clicking on all cylinders on the possession front, and they'll look to ride that advantage to a series clinching win on Saturday.